This weekend was a time of change. Not only did my little blog get a facelift (you like? ), but the weather in New York was starting to feel like spring! That means I get to wear one of my favorite spring stapes - the maxi dress. This one is from SWAK and I just looove the colors on it! 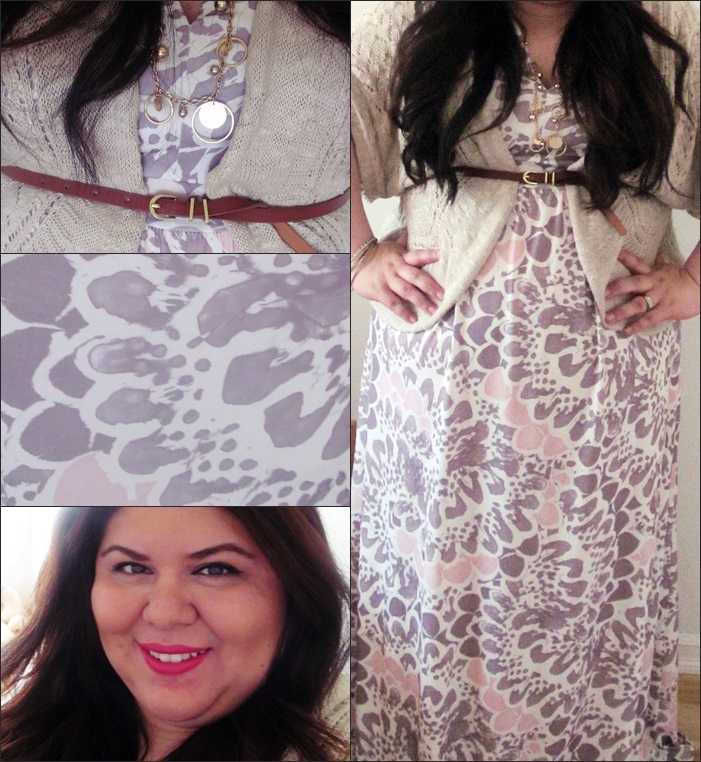 The taupe and pink make such pretty combination, and the print is perfect for spring. I will say that if you are challenged in the height department like me, you will need to get this dress tailored because SWAK designs tend to be long. Other than that - Loves! This max is so beautiful! Definitely headed to check it out... happy monday! I love the new blog design! That was the first thing I noticed. We had a beautiful weekend also. A perfect time to pull out the maxi. Two of my fav color combos, pink & grey! You look very nice! Love the maxi! Love the new design boo! How about the 70 degrees we are having today! Right!! I love MAxi dresses for Spring/Summer too. love the delicate color and bold print on this one! You look great and love the sleek design of ur blog! Hope you are having a wonderful day! I love this maxi dress. The colors are so beautiful. You look gorgeous! I love this maxi dress. I'm becoming more and more of a fan of them. You look great & I love the belt over the sweater & Dress! The blog looks great, I love the soft colors. This is so feminine and cute! Love it! Oh my! I LOVE the blog face lift. Seriously so great! Your belted dress is really pretty too. BEAUTIFUL!!! i love the maxi dress with the belt. such a pretty pattern on the dress! And the dress is pretty too!!! What a pretty maxi dress. Love the pattern & colors. I have never belted my maxi dresses before - gotta give this a try. I love the print of your dress, you look great! Thanks for visiting my blog, I'm glad it brought me to yours! You look gorgeous lady! Love the print!